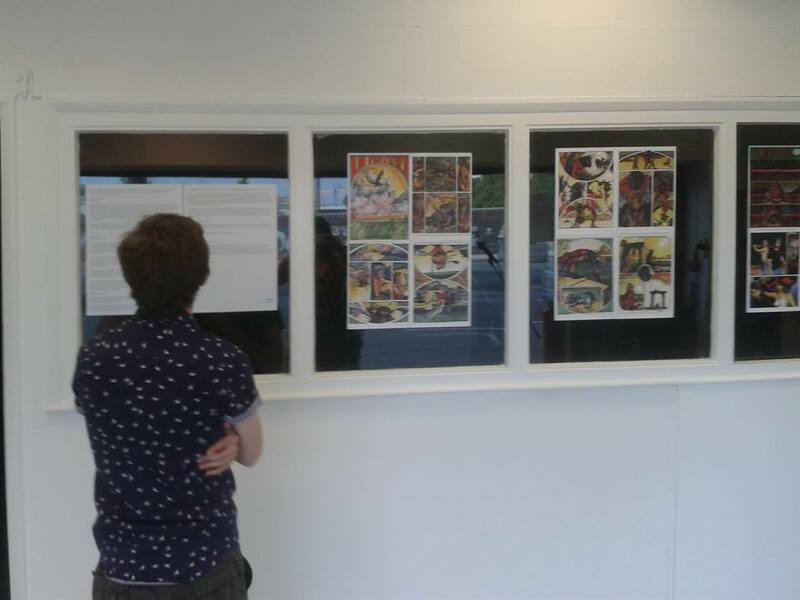 On Friday night, we sent Jodie Ashdown along to the opening of a new gallery in the old Cardiff Bus ticket office. 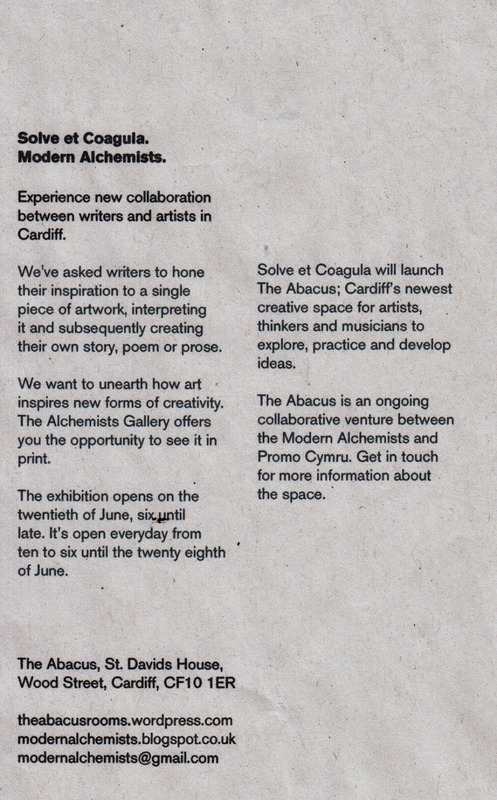 The place is now called The Abacus, and is currently hosting the Modern Alchemists’ exhibition, Solve et Coagula. 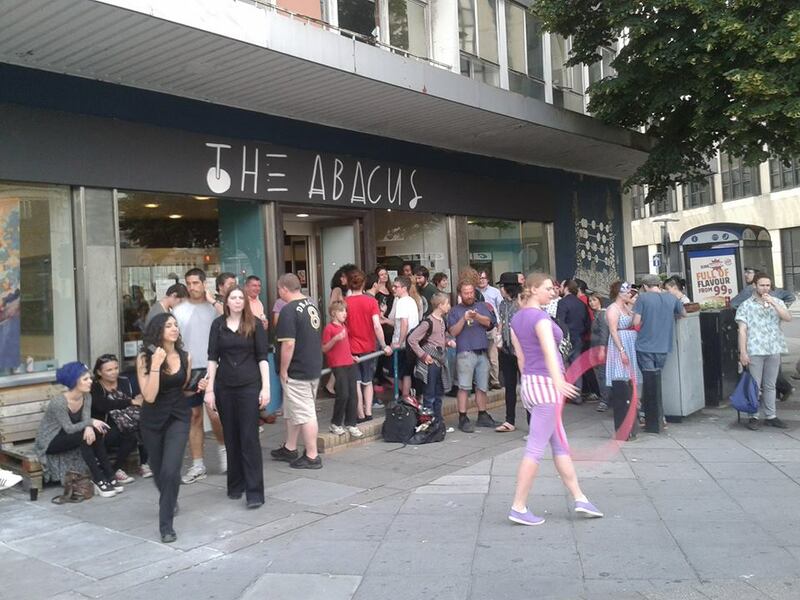 Friday 20 June 2014 was the opening night of the latest Modern Alchemists exhibition in their new space named The Abacus, which is just over the road from Cardiff Central Bus Station. Being the old bus ticket office, it looked pretty grim when they first got it (believe me, I helped rip up the carpets) but they’ve made the place their own and turned it into a perfect exhibition space. And their first event? Solve et Coagula. But this isn’t just any old art show, the guys at the Modern Alchemists decided to put a call out for writers to create a piece of ekphrastic writing (this is a fancy word I learnt at uni, it just means to be inspired by art) based on artwork created by local artists. The idea was simple, selected writers would be sent a piece of submitted art anonymously and were asked to come up with a poem, play, rap, composition or story inspired by it. I myself was sent an amazing comic which included a minotaur, a women on a flying lion, cookies and a vomiting eagle by the very talented Borja Perez Mielgo. I found it a challenge to produce a piece of writing which did the piece justice, but also represented me as a writer but was happy with how it came out. The experience was a unusual yet creatively stimulating one, and I really enjoyed it. 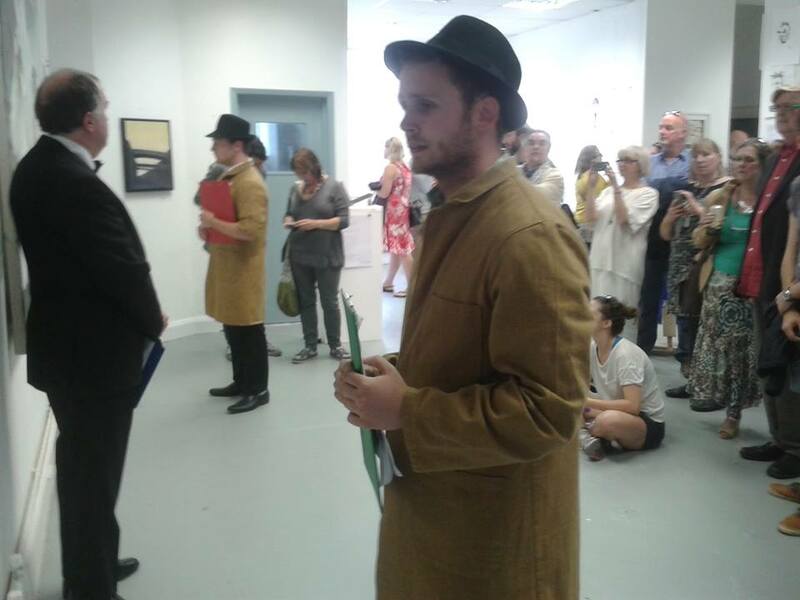 The artists hadn’t read any of the written work before the exhibition, so it was interesting to see their reactions as they engaged with the words, and as there were over 30 artists and 50 writers, there was a lot going on. 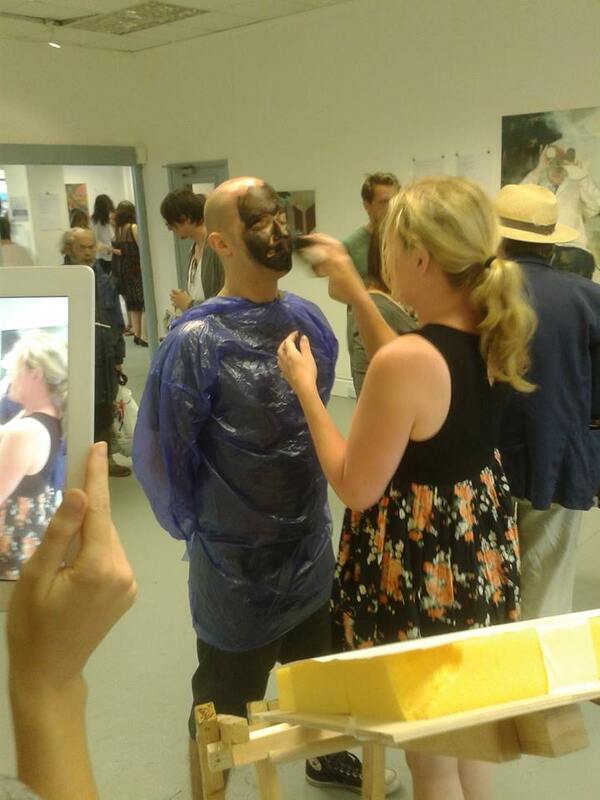 As well as the artwork and written pieces, there were live poetry readings by some of the writers, a play, music, a DJ, beers and a contraption which smushes your newly painted face onto a piece of blank paper. There’s also visual instalments, including a piece in a little room under the stairs which I can only describe as a David Lynch-esque-Vulcan-mind-meld. Make sure you close the door after yourself, to get the full effect. The exhibition also included work by We Are Cardiff’s very own Helia which took roots in the sad demise of Cardiff’s Coal Exchange. The exhibition is open for another few weeks so get yourself down there to check out some local talent (the creative type, rather than those queuing up outside O’Neill’s) and experience some originality. Modern Alchemists are a pretty interesting group as well – they’re a voluntary, not-for-profit social enterprise, so plenty more interesting projects coming up from them in the near future…. A wonderful exhibition in an exceptional gallery space. Keep it up because Cardiff needs the creative talents of the Modern Alchemists. Definitely agree. So nice to see empty buildings like the old ticket office being used for things like this!